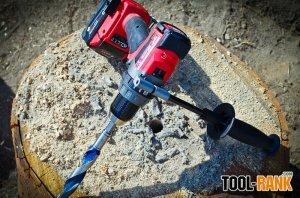 Tool Blog Editorial How Much Torque Does Your Cordless Drill Need? When it comes to cordless drills, how much torque do you really need? As we have come to expect from cordless tool manufacturers, with each new flagship drill model that comes out, we want a tool with more torque than what the previous model had. My question is, do we really need more torque or are we just after bragging rights for the highest number. I get that in certain applications it is important to have the torque to be able to power through dense lumber with a large hole saw or drill bit, but at some point manufacturers are going to reach the limit of what is needed or what is safe to operate. At over 1,000 in.-lbs. of torque, I think we are just about at that limit. We have all heard stories or legends of someone that broke their wrist when a powerful drill overpowered their strength and got away from them, and whether fact or fiction, the dangers are real. This is why impact drivers are so popular and are favored in many high torque scenarios. The torque levels are already so high that at full power even the additional side handle is not enough to control a drill that binds without really bracing your body. So at what point are we going to say that we have had enough, that we have reached the limit of what is safe or necessary, that we are happy with what we have, and that we don't need any more torque? Wouldn't it be a better option for users to offload their high torque needs to their impact driver? At this point, manufacturers should be developing auger bits and hole saws that are designed to work with impact drivers. And if the 1/4" quick-connect chuck is not strong enough for such bits, maybe it is time for manufacturers to move away from them, or to adopt a dual chuck system like what is found in the Bosch Socket-Ready impacts. If manufacturers didn't have to work on engineering for more torque on each new model, could they spend their time and resources on other ways to improve our drills? I am no engineer, so I am not sure what is possible, or if even adding torque adds significantly to production and design costs, but if I had my way we would stop. At this point, I would rather they spend their time and our money on new innovations and on squeezing the most amount of runtime out of their batteries. As it turns out, while writing this article, Stuart over at ToolGuyd was writing a similar article. You can read his thoughts here. To touch on one of his points, Manufacturers are building in safety features to reduce the risk of drill kick, but the fact that we even need them kind of proves how crazy-high the torque levels in drills have become. They are so high that they have to engineer ways to make the tool safe. To think, the torque in drills is higher than the torque of impact drivers of only a few years ago. So what are you thoughts on the matter? Are the torque levels high enough, or do you want more power?